This beautiful, early 19th century nightgown is in good shape now, but it will become a bloody mess when Becky Cotton finishes with her husband – who is going to get the axe. 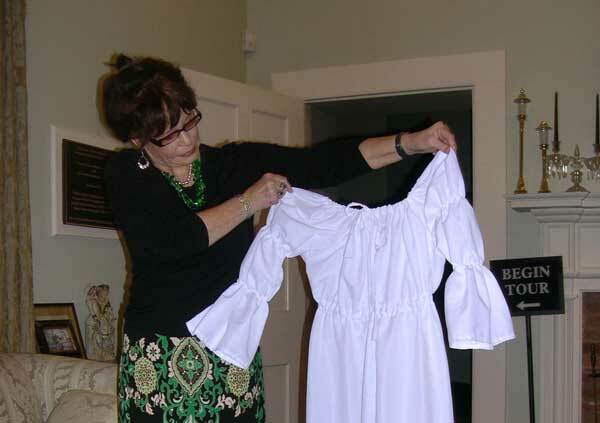 Tricia Glenn, who holds Becky Cotton’s 19th century nightgown in a photograph published with this story, has written a play about Edgefield’s iconic murderess, and according to Glenn her act of murder on her husband is what precipitated the eventual name given to Edgefield – “Bloody Edgefield” –for it was the first of numerous murders, duels and acts of violence of notoriety that followed, for many years. The play will be produced on stage at the Discovery Center in the William Miller Bouknight Theatre in mid October, with Susie O’Neal as director. Billy Benton, president of the Edgefield County Historical Society (ECHS), stars as Parson Weems, the peripatetic parson who preached a sermon that he developed from the story of the murderess. This production is the second in the Selective History series, sponsored by the ECHS. The first of the series was written and directed by Susie O’Neal, A Moral Compass, which looked at moral perceptions of some of the characters in the Logue-Timmerman case. Tickets are already on sale for the play, and seats are limited because of the size of the theatre and the popularity of the subject.